1Heart Rhythm Management Centre, Postgraduate course in Cardiac Electrophysiology and Pacing, Vrije Universiteit Brussel, Universitair Ziekenhuis Brussel- Laarbeeklaan 101, 1090 Brussels, Belgium.2Electrophysiology Unit, Maria Cecilia Hospital, Gruppo Villa Maria - Via Corriera 1, 48033 Cotignola, Italy..3Anaesthesiology Department, Vrije Universiteit Brussel, Universitair Ziekenhuis Brussel- Laarbeeklaan 101, 1090 Brussels, Belgium..4Division of Cardiology, Spedali Civili Hospital, Brescia, Italy. * Drs Salghetti and Abugattas contributed equally to the article as first author..
Real Time Recordings (RTR) of pulmonary vein (PV) activity provide important information in the setting of the 2nd generation Cryoballoon (CB-A), as a funcion of time to isolation. Visualization of RTR with the standard inner lumen mapping catheter (ILMC) 20mm Achieve (AC) is possible in roughly 50% of PVs. A novel 25mm-Achieve Advance (AC-A) has been developed with the aim of increasing the detection of RTR. The purpose of this study is to compare the AC-A with the AC, to feasibility and improvement of RTR. We assigned 50 patients with paroxysmal or persistent atrial fibrillation to CB-A PVI, using the AC-A as ILMC. We compared this group with 50 patients, matched for age and left atrial volume, who previously underwent the CB-A PVI using the AC. RTR were more frequently observed with the AC-A than with the AC (74% vs 49%; p= 0.02). RTR in the left superior PVs was similar in both groups (74% vs 72%, p= 0.8). RTR with the AC-A were equally appreciated in left or right sided, superior or inferior PVs. No significant differences were found in terms of feasibility, procedure fluoroscopy and freezing times, nadir temperatures, and acute PVI. CB-A PVI with the AC-A is feasible and safe in all PVs. The AC-A has proven significantly superior in visualising RTR if compared to the AC, affording RTR in 74% of PVs. Key Words : Achieve Advance Catheter, Cryoballoon Pulmonary Vein Isolation, Real Time Recordings, Time To Pulmonary Vein Isolation. Correspondence to: Gian Battista Chierchia Heart Rhythm Management Centre Universitair Ziekenhuis Brussel, Vrije Universiteit Laarbeeklaan 101, 1090 Brussels, Belgium. Real Time Recordings (RTR) of pulmonary vein (PV) electrical activity provide important information in the setting of the 2nd generation Cryoballoon (CB-A) pulmonary vein isolation (PVI) for the management of atrial fibrillation (AF) [1-3]. Data available in the literature indicate that RTR, as a function of time to PV isolation, can predict effective isolation of PV in the long term, and they may become the cornerstone to perform the best freeze [2,3]. To date, CB-A PVI is usually documented in real time by the standard 20mm Achieve (AC) (Medtronic, Minnesota, USA) inner lumen mapping catheter (ILMC) during the cryoenergy application. However RTR with the AC is possible only in nearly half of the PVs, as it has been demonstrated in several previous studies and this ILMC cannot be enought reliable to guide real time PVI [4-7]. Consequently, a novel ILMC, the 25mm-Achieve Advance (AC-A) (Medtronic, Minnesota, USA) has been developed to overcome this limitation, incresing the possibility to better detect RTR during PVI. No studies comparing the latter AC-A with the standard AC have been carried out yet. The main aim of the study consisted in the assessment of the feasibility of CB-A ablation in conjunction with the novel 25mm AC-A compared to the standard 20mm AC, in terms of the rate of visualisation RTR during ablation, and successful acute PVI. From February 2017 to beginning of April 2017, consecutive patients who underwent PVI as an index procedure with the CB PVI using the novel 25 mm AC-A as mapping catheter consisted in the study population. This group (case group) was subsequently matched for age and left atrial (LA) volume (ml/m2) with patients who underwent the same procedure using the 20 mm AC, during the previous months (control group). Finally 100 patients were included in the analysis (50 patients in each group). All patients provided written informed consent prior to the procedure. Inclusion criteria for PVI with the CB were patients with paroxysmal or persistent AF - refractory at least to one anti-arrhythmic drug AAD) – who underwent AF ablation for the first time. To exclude the presence of thrombi in the left atrial appendage (LAA), all patients underwent twodimensional (2D) trans-esophageal echocardiography (TEE) the day before the procedure, along with a trans-thoracic examination (TTE) enabling assessment of LA dimensions, left ventricular, and valvular function. Also, prior to procedure, detailed information on LA anatomy was obtained by computed tomographic (CT) scan. Antiarrhythmic drug therapy was discontinued prior to ablation, according to the pharmacokinetics. Exclusion criteria were the presence of LA thrombus, severe uncontrolled heart failure, contraindications to general anesthesia and LA diameter ≥ 50 mm. The study was in compliance with the principles outlined in the Declaration of Helsinki and approved by the institutional ethics committee of our Institution. The AC catheter is an ILMC specifically designed to be used in conjunction with CB to obtain RTR PV electrograms during cryoenergy application, with the double purpose of being a mapping catheter and a supporting guidewire for the CB-A. The proximal part of the catheter is a 146 cm long stainless steel tube of 3.3.F diameter. 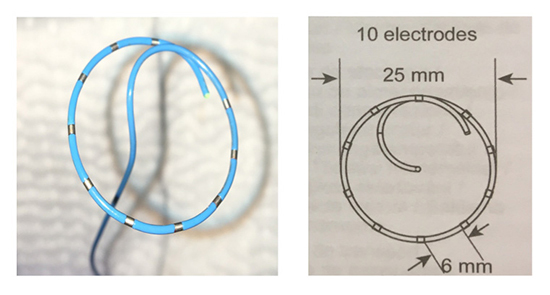 The distal part consists of 10 electrodes positioned on a 25 mm circular loop with an intelectrode distance of 6 mm. The latter has been recently developped (2ACH25 Achieve Advance ST Mapping catheter – Medtronic), based on the assumption that a larger diameter and 2 additional electrodes might yield a higher chance of contact with the PV ostium and consequently enhance the possibility of detecting PV potentials (PVPs) and therefore RT isolation. (Figure 1A,Figure 1B and Figure 1C). The CB-A ablation procedure has been described in detail previously [8,9]. All procedures were performed under general anaesthesia. The operators involved in performing CB-A PVI in the AC group were the same operators who performed the CB-A PVI in the AC-A group and they were senior-experienced in this field. Briefly, a steerable 15 Fr sheath (Flexcath, Medtronic) was placed in the LA through a single transseptal puncture (TSP). 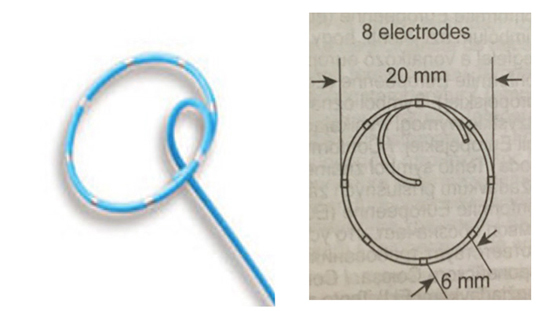 Before introducing the balloon catheter in the sheath, the ILMC was inserted in the lumen of the CB-A. The insertion technique of the ILMC in the inner lumen of the CB-A is identical for both the AC and AC-A catheters. Then the 28 mm CB-A (Arctic Front Advance, Medtronic) was advanced through the sheath into the LA with the ILMP used as a guidewire. Before ablation, for each PVs the ILMC was positioned in the ostium to record baseline electrical activity. Then, the ILMC was advanced more distally similarly to a guidewire and the CB-A was wedged in the ostium to occlude the vein. Optimal vessel occlusion was considered to have been achieved when selective contrast injection showed total contrast retention with no backflow to the atrium. Vessel occlusion was evaluated according to a semiquantitative grading, ranging from grade 0 (very poor occlusion) to grade 4 (perfect occlusion). Once occlusion was documented, cryothermal energy was started delivering a single freeze–thaw cycle of 180 seconds (s) for each vein [10, 21]. Based on previous findings, a second freeze-thaw cycle of 180 s was delivered when at the first freeze RT isolation occured after 60 s (when PVPs were visible) and/or the specific parameter of -40°C within the first 60 s was not reached . Specifically, if a temperature of -40°C was not reached within the first 60 seconds despite very early isolation a bonus freeze was performed, since reaching -40 within 60 seconds it has been proven to be a strong protective factor to increase the probability of long lasting PVI (β Coefficient -1.13) . However, future studies including larger cohorts of patients based on dosing strategies guided by RTR might lead us to modify our strategy. If PVPs were visible during energy application, time and temperature to isolation were recorded when PVPs completely disappeared or were dissociated from LA activity. Pacing maneuvers for the differentiation of any potential non-PV sources were applied as mentioned above. If PVPs were not visible during ablation, the temperature-guided approach of – 40°C within first 60 s was taken to assess an effective application . Once the application ended, if PVPs were not visible during the freeze, the ILMC was retracted to a more proximal position in the ostium were electrical information had been recorded prior to ablation. In order to avoid phrenic nerve palsy (PNP), a complication observed during right-sided PVs ablation with CB, a bipolar catheter was inserted in the superior vena cava, and diaphragmatic stimulation was achieved by pacing the ipsilateral phrenic nerve with a 1200 ms cycle at an output of 20 mA. Phrenic nerve capture was monitored both via the femoral venous pressure waveform (VPW) analysis and with tactile feedback by placing the operator’s hand on the patient’s abdomen. VPW monitoring has been described in detail previously . Refrigerant delivery was immediately stopped if VPW decreased of more than 50% of the peak to peak initial value, and weakening or loss of diaphragmatic movement was noted. After transeptal access, activated clotting time (ACT) was maintained over 250 with supplements of heparin infusion, as required. All patients were dismissed the day following ablation. A 2D TTE was performed in all individuals in order to exclude postprocedural pericardial effusion. Low molecular weight heparine (LMWH) was started the same day following ablation and continued until target international normalized ratio (INR) was between 2-3. Oral anticoagulation (OAC) was started the same evening after the procedure. In patients under NOAC therapy, the latter was restarted the same day following ablation, without LMWH bridging. Statistical differences were calculated using x2 test for discrete variables and t-test for continuous variables (expressed as mean values and standard deviation). All statistical analyses were performed using the SPSS software (SPSS v24, IL, USA). A p value > 0.05 was considered statistically significant. Mean age of the total population was 58 + 13 years (65 male; 65%). There were no statistical differences in the baseline clinical characteristics between both patient groups (“25 mm/AC-A” group and “20 mm/AC” group). All patients underwent preprocedural cardiac CT scan. Left common ostium was identified in 10 patients (20%) of the 25mm-group and in 7 patients (14%) of the 20mm group; 1 right middle vein (2%) was identified in the 25mm group no other accessory vein was identified. Baseline characteristics are shown in Table 1. Continous variable values are expressed as mean ± standard deviation. A 28 mm CB-A was used in all patients. Mean procedure time, considered from first groin puncture to complete sheath extraction (61.9+-15 min vs. 66.5+-14.6 min, p = 0.126) and fluoroscopic time (14.2+-6.2 min vs. 15.5+-9.2 min, p = 0.386) did not differ significantly between both groups. There was no statistical difference either in the mean freezing time (min), or in the number of veins that required more than 1 freeze. There was no need to switch to a regular guidewire in any procedure in both groups. No serious adverse events occurred in any procedure. Transient phrenic nerve palsy was observed in 4 patients (8%) of the AC group and in 1 patients (2%) of the AC-A group (p = 0.36), while freezing in 3 RSPVs and in 2 RIPVs. Diaphragmatic contraction completely recovered in each case before the termination of the procedure. To the best of our knowledge, this is the first study comparing the novel 25 mm AC-A catheter with the standard 20 mm AC, in the context of 2nd generation CB-A. The main findings are that: (1) Overall, the RTR were significantly more frequently observed with the AC-A than with the standard AC. (2) RTR in the LSPVs were observed with similar rates in both groups. (3) RTR with the AC-A can be equally appreciated in left or right sided, superior or inferior PVs, (4) PVI with the CB-A using the novel AC-A is feasible, safe and effective in all veins, and (5) no significant differences were observed between both ILMC in terms of acute successful isolation, procedure-time, fluoroscopy-time and freezing-time. Recent articles have highlighted the importance of temperature attainment as a predictor of successful PV isolation. Deubner et al  interestingly demonstrated that a steeper temperature slope descent in the first instances of the freeze proved to reliably predict acute PV isolation. In addition, Iacopino et al. showed comparable clinical outcomes between a traditional approach with an ILMC and an ablation strategy solely guided by temperature in the setting of second generation CB ablation. However, although temperature is an extremely important parameter, Time To Isolation (TTI), provided by RTR of PV electrograms, has also demonstrated to be a strong predictor of durable PVI [2,3] . Specifically, the publication by Ciconte et al. , focusing on potential predictors of late PV reconnections after CB-A reported that, on a multivariable analysis, longer time to PVI (P=0.03) and failure to achieve −40°C within 60 s (P=0.05), independently predicted late PV reconnection. In addition, a 60-s cutoff for time to PVI guaranteed persistent isolation in the long-term with 96.4% negative predictive value. Most importantly, TTI proved to be the most significant predictor of long lasting PVI. The latter statistically overpowered the temperature parameter of −40°C within 60 s. The above mentioned considerations were confirmed successively by the recent ICE T trial . The ICE T showed that a strategy based on early PVI achieved similar results to the classical freeze-thaw-freeze approach . Baring this in mind, an enhanced visualisation of RTR in conjunction with the analysis of the temperature during the freeze might pave the way to the ideal parameters one should follow in order to guarantee permanency of PV isolation. Therefore, the operator might choose to abort the application and reposition the balloon with another orientation in the PV ostium in case of persistence of LA-PV conduction after 60 s. According to recently published articles the standard 20mm-AC seems to afford visualisation of RTR in roughly 50% of PVs [4,5,6,7]. In the setting of CB ablation occlusion of the targeted PV is paramount in this specific technique and all efforts should be made to obtain a complete seal at the level of the PV ostium . This often forces the operator to position the ILMC deeper in the vessel in order to guarantee support of the CB during its positioning in the PV ostium. A deeper positioning of the ILMC tends to somewhat jeopardize the possibility of visualising potentials because of the short and variable distal extension of muscular sleeves in the PVs [15,16]. In our experience, the novel AC-A proved significantly superior to its predecessor in terms of visualisation of RTR. Although, our standard practice is to deliver 180 seconds duration cryoapplications, a tool permitting a higher rate of RTR visualisation might help paving the way towards the ideal dosing strategy. In this setting the AC-A might prove very useful. Not surprisingly, in our study, the LSPV was the vein in which RTR could be detected by both ILMC in comparable proportions. This is obviously explained by the fact that only the LSPV’ ostium is anatomically coaxial to the CB-A system when crossing the interatrial septum. Therefore, less effort in manoeuvring the latter is required to occlude this particular vein. This leads to favorably positioning the ILMC in a more proximal position without jeopardising the occlusion. The above mentioned consideration is supported by the observations reported in an article by Sorgente et al. . In this study, a strong inverse association was found between the PV-ostia angle of orientation in the frontal plane (obtained from Multislice cardiac computed tomographic imaging) and the CB-A degree of occlusion in each vein. The sharper the CB-A angulation, the higher was the probability of loss of the central alignment of the system at the PV ostia. Therefore, the other veins are typically more difficult to occlude with the CB-A, often leading the operator to place the ILMC more distally to ensure balloon stability and this may be the main reason why the AC fails to record RTR frequently. The novel AC-A has shown to be equally effective in all PV for the detection of RTR, without difference between left or right sided, superior or inferior vessels. This might be due to the larger diameter of the distal loop and the presence of 2 additional electrodes on it’s circular tip. These novel characteristics might allow better contact with a wider area of the PVs wall. The approach to the PV ostium might be more straightforward than with the traditional AC in detecting RTR. A recent study by Boveda et al. meticulously described specific manoeuvres designed to maximize RT recordings during second-generation CB-A ablation with the standard 20mm AC . The authors demonstrated that, with specific torqueing and pacing maneuvers, overall RT assessment of PV disconnection was possible in 97.7% of cases, after a mean duration of 48.6 ± 33.0 s. However, the operator had to rely often on exit block verification during CB application. Since entry block implies exit block in the context of PVI , exit block verification may be an effective alternative to confirm PV after CB application, even if performig properly these manoeuvres with the ILMC might be difficult. Moreover, direct disappearance or dissociation of PVPs from LA activity might be significantly more simple to interpret. Finally, when pacing to analyse RT documentation of PV exit block in the right-sided veins, an additional external pacing source is needed to pace the phrenic nerve and monitor diaphragmatic contraction. These manoeuvres might therefore render a somewhat originally straightforward ablation procedure more complex and cumbersome. This is one of the reasons why we didn't perform this complex maneuvers. Then we used the same "standard"/"easy to follow" positioning-technique for both ILMC, in order to make the comparison feasible and more realistic, and also to provide a reproducible result in everyday practice of less experienced centers. We advanced the AC-A inside the PVs to guarantee a complete occlusion, and then we pulled it back closer to the PVs ostium. In this way we observed that the simple approach to the PV ostium might be more straightforward with the AC-A than with the traditional AC in detecting RTR. The AC-A might detect RTR even when it has been placed distally into the vein and the loop is despiralized deep inside the PVs, because it is 1.2 cm longer than its predecessor and the proximal electrodes might be pulled nearer to the PVs ostium to detect electrical activity, without losing CB-A stability. However, performing meticolously the above-mentioned torqueing and pacing maneuvers would have certainly led to a higher incidence of RTR visualization. Additionally, we did not observe any differences in terms of mean number of freezes or freezing times between both ILMCs. This lack of difference is certainly due to the standardised procedural workflow performed in our laboratory in the setting of CB ablation. To note, this study describes our very first experience with the ACA versus a very established routine with the AC in our team’s daily clinical practice. In fact our findings did not show differences in terms of procedural times, fluoroscopy exposure and success rate. However, although it is universally accepted that the success of the cryoballoon technique is tightly related to the achievement of PV occlusion, a greater experience with the ACA might hypothetically lead to shorter procedural and fluoroscopic times in the future. Moreover, the shaft of the novel AC-A is softer if compared to its predecessor's, therefore the supporting action provided by this catheter may seem poorer than the standard AC. In our experience, we could feel this while performing the first cases with the AC-A, however this actually did not prevente either to reach an effective occlusion or to complete successful isolation in all PVs. We did not observe any significant difference in the rate of RTR visualisation between type of veins with the AC-A. This is an important finding. In fact the PV sleeves are typically shorter in the inferior veins with respect to their superior counterparts [15,16] and the occlusion of these veins often requires more handling of the CB system and not seldomly the ILMC has to be positioned more distally . Typically, the rate of visualisation of RTR varies greatly between the different types of PVs when using the traditional AC [4,5]. Observing RTR with similar proportions in the PV ostia is a definite leap forwards in CB-A ablation in conjunction with the novel AC-A. It is not yet proven if a higher visualization rate of RTR will be clinically significant to improve long-term PVI. However, the growing idea is that a novel tailored approach to each vein based on RTR might be the key to obtain the ideal safety- efficacy balance. For example, if a PV is isolated very early in the freeze, the need to complete a 180 second cycle might not be required. As previuosly discussed, several studies have identified the TTI as a critical procedural variable. TT-PVI emerged as a powerful marker of acute and durable PV isolation [2,3]. Furthermore, it might also be instrumental in reducing the need for the number of cryoapplications as well as the procedural duration and fluoroscopic exposure. Aryana et al. recently described a novel atrial fibrillation cryoablation dosing algorithm guided by time-to-pulmonary vein isolation and compared it with the conventional procedure (Cryo-DOSING Study). In the "Cryo-AF Dosing cohort" a single cryo-application was applied to a given PV if the TTI measured ≤60 seconds and the duration of that application consisted of TTI + 2 minutes. Interestingly, they found that TTI might be effectively used to guide and individualize the ablation dosing strategy during Cryo-AF, yielding an equivalent and high rate of acute PV isolation. Moreover, this approach was associated with improved durability of PV isolation at repeat procedures and a lower incidence of atypical atrial flutters/tachycardias during long-term follow-up. The authors believe that this characteristic was likely a consequence of a more tailored ablation strategy. Third, the TTI–guided dosing algorithm improved the procedural efficiency, allowing for fewer and shorter applications, reduced left atrial dwell, ablation, and procedure times. Adverse event rates and freedom from recurrent AF during long-term follow-up were equivalent between the 2 ablation strategies. The ICE T Trial similarly described that an individualized CB PVI strategy allows faster atrial fibrillation ablation without affecting the favorable clinical outcome and that a short TTI appears to predict freedom from recurrent atrial tachyarrhythmia . This might also hypothetically reduce the incidence of undesired damage to extra cardiac structures such as the oesophagus  without jeopardising the permanency of PVI. The study was a non-prospective, non-randomized, single-center case-control trial conducted in a relatively small number of patients. The definition of success was limited to the procedural outcomes and a follow-up period was not considered. Despite the evidence of effective and reproducible manoeuvres to optimize monitoring of RTR, we did not use any of them in order to maintain a simple and straightforward approach. Performing these maneuvers would have certainly led to a higher incidence of RTR visualization. Larger randomized studies with longer follow-up are needed to prove novel Achieve Advance catheter is superior in terms of efficacy and safety during cryoballon ablation of atrial fibrillation and to understand whether the increased capability to detected RTR with AC-A during CB-A PVI means increased number of long-lasting isolated PVs. Carlo de Asmundis receives compensation for teaching purposes and proctoring from AF solutions, Medtronic, member steering committee ETNA-AF-Europe Daiichi Sankyo Europe. 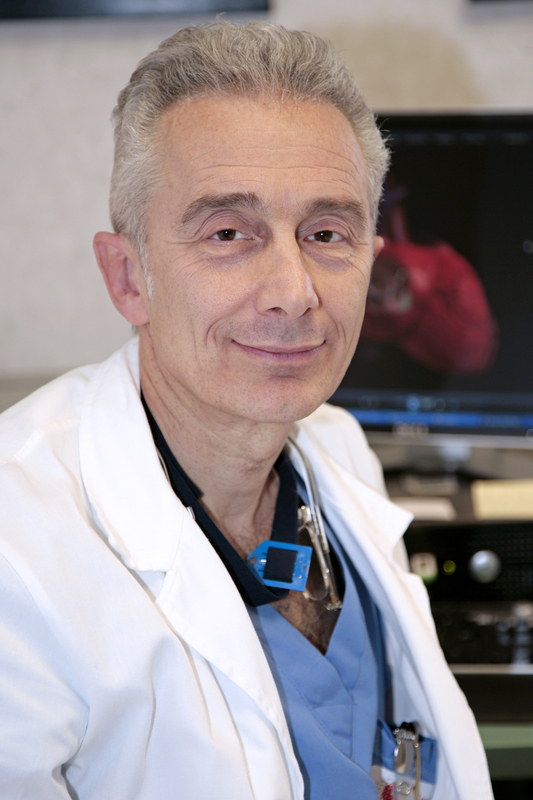 Gian Battista Chierchia receives compensation for teaching purposes and proctoring from AF solutions, Medtronic. Pedro Brugada receives research grants on behalf of the centre from Biotronik, Medtronic, St Jude Medical, Sorin, Boston Scientific and speakers’ fees from Biosense-Webster, Biotronik, Medtronic and Boston Scientific. CB-A ablation in conjunction with the novel 25 mm AC-A ILMC is feasible, safe, and affords PVI in all veins. The 25 mm AC-A has proven significantly superior in visualising RTR if compared to the standard 20 mm AC, affording RTR in 74% of PVs without the need of adjunctive pacing maneuvers. Parkash Ratika, VermaAtul, TangAntony S L. Persistent atrial fibrillation: current approach and controversies. Curr. Opin. Cardiol. 2010;25 (1):1–7. Wijffels M C, KirchhofC J, DorlandR, AllessieM A. Atrial fibrillation begets atrial fibrillation. A study in awake chronically instrumented goats. Circulation. 1995;92 (7):1954–68. Fassini Gaetano, RivaStefania, ChiodelliRoberta, TrevisiNicola, BertiMarco, CarbucicchioCorrado, MaccabelliGiuseppe, GiraldiFrancesco, BellaPaolo Della. Left mitral isthmus ablation associated with PV Isolation: long-term results of a prospective randomized study. J. Cardiovasc. Electrophysiol. 2005;16 (11):1150–6. Hocini Mélèze, JaïsPierre, SandersPrashanthan, TakahashiYoshihide, RotterMartin, RostockThomas, HsuLi-Fern, SacherFrédéric, ReuterSylvain, ClémentyJacques, HaïssaguerreMichel. Techniques, evaluation, and consequences of linear block at the left atrial roof in paroxysmal atrial fibrillation: a prospective randomized study. Circulation. 2005;112 (24):3688–96. Kong Melissa H, PicciniJonathan P, BahnsonTristram D. Efficacy of adjunctive ablation of complex fractionated atrial electrograms and pulmonary vein isolation for the treatment of atrial fibrillation: a meta-analysis of randomized controlled trials. Europace. 2011;13 (2):193–204. Verma Atul, MantovanRoberto, MacleLaurent, De MartinoGuiseppe, ChenJian, MorilloCarlos A, NovakPaul, CalzolariVittorio, GuerraPeter G, NairGirish, TorrecillaEsteban G, KhaykinYaariv. Substrate and Trigger Ablation for Reduction of Atrial Fibrillation (STAR AF): a randomized, multicentre, international trial. Eur. Heart J. 2010;31 (11):1344–56. Wong Kelvin C K, PaiseyJohn R, SopherMark, BalasubramaniamRichard, JonesMichael, QureshiNorman, HayesChris R, GinksMatthew R, RajappanKim, BashirYaver, BettsTimothy R. No Benefit of Complex Fractionated Atrial Electrogram Ablation in Addition to Circumferential Pulmonary Vein Ablation and Linear Ablation: Benefit of Complex Ablation Study. Circ Arrhythm Electrophysiol. 2015;8 (6):1316–24. Calkins Hugh, KuckKarl Heinz, CappatoRiccardo, BrugadaJosep, CammA John, ChenShih-Ann, CrijnsHarry J G, DamianoRalph J, DaviesD Wyn, DiMarcoJohn, EdgertonJames, EllenbogenKenneth, EzekowitzMichael D, HainesDavid E, HaissaguerreMichel, HindricksGerhard, IesakaYoshito, JackmanWarren, JalifeJose, JaisPierre, KalmanJonathan, KeaneDavid, KimYoung-Hoon, KirchhofPaulus, KleinGeorge, KottkampHans, KumagaiKoichiro, LindsayBruce D, MansourMoussa, MarchlinskiFrancis E, McCarthyPatrick M, MontJ Lluis, MoradyFred, NademaneeKoonlawee, NakagawaHiroshi, NataleAndrea, NattelStanley, PackerDouglas L, PapponeCarlo, PrystowskyEric, RavieleAntonio, ReddyVivek, RuskinJeremy N, SheminRichard J, TsaoHsuan-Ming, WilberDavid. 2012 HRS/EHRA/ECAS Expert Consensus Statement on Catheter and Surgical Ablation of Atrial Fibrillation: recommendations for patient selection, procedural techniques, patient management and follow-up, definitions, endpoints, and research trial design. Europace. 2012;14 (4):528–606. Schoenfeld D A, RichterJ R. Nomograms for calculating the number of patients needed for a clinical trial with survival as an endpoint. Biometrics. 1982;38 (1):163–70. Vogler Julia, WillemsStephan, SultanArian, SchreiberDoreen, LükerJakob, ServatiusHelge, SchäfferBenjamin, MoserJulia, HoffmannBoris A, StevenDaniel. Pulmonary Vein Isolation Versus Defragmentation: The CHASE-AF Clinical Trial. J. Am. Coll. Cardiol. 2015;66 (24):2743–2752. Bunch T Jared, WeissJ Peter, CrandallBrian G, MayHeidi T, BairTami L, OsbornJeffrey S, AndersonJeffrey L, LappeDonald L, MuhlesteinJ Brent, NelsonJennifer, DayJohn D. Long-term clinical efficacy and risk of catheter ablation for atrial fibrillation in octogenarians. Pacing Clin Electrophysiol. 2010;33 (2):146–52. Zado Erica, CallansDavid J, RileyMichael, HutchinsonMathew, GarciaFermin, BalaRupa, LinDavid, CooperJoshua, VerdinoRalph, RussoAndrea M, DixitSanjay, GerstenfeldEdward, MarchlinskiFrancis E. Long-term clinical efficacy and risk of catheter ablation for atrial fibrillation in the elderly. J. Cardiovasc. Electrophysiol. 2008;19 (6):621–6. Rosenberg Michael A, ManningWarren J. Diastolic dysfunction and risk of atrial fibrillation: a mechanistic appraisal. Circulation. 2012;126 (19):2353–62. Güler Ekrem, GülerGamze Babur, DemirGültekin Günhan, KizilirmakFiliz, GüneşHaci Murat, BarutçuIrfan, KiliçaslanFethi. Effect of Pulmonary Vein Anatomy and Pulmonary Vein Diameters on Outcome of Cryoballoon Catheter Ablation for Atrial Fibrillation. Pacing Clin Electrophysiol. 2015;38 (8):989–96. Roux Jean-François, ZadoErica, CallansDavid J, GarciaFermin, LinDavid, MarchlinskiFrancis E, BalaRupa, DixitSanjay, RileyMichael, RussoAndrea M, HutchinsonMathew D, CooperJoshua, VerdinoRalph, PatelVickas, JoyParijat S, GerstenfeldEdward P. Antiarrhythmics After Ablation of Atrial Fibrillation (5A Study). Circulation. 2009;120 (12):1036–40. Leong-Sit Peter, RouxJean-Francois, ZadoErica, CallansDavid J, GarciaFermin, LinDavid, MarchlinskiFrancis E, BalaRupa, DixitSanjay, RileyMichael, HutchinsonMathew D, CooperJoshua, RussoAndrea M, VerdinoRalph, GerstenfeldEdward P. Antiarrhythmics after ablation of atrial fibrillation (5A Study): six-month follow-up study. Circ Arrhythm Electrophysiol. 2011;4 (1):11–4. Di Biase Luigi, ContiSergio, MohantyPrasant, BaiRong, SanchezJavier, WaltonDavid, JohnAnnie, SantangeliPasquale, ElayiClaude S, BeheirySalwa, GallinghouseG Joseph, MohantySanghamitra, HortonRodney, BaileyShane, BurkhardtJ David, NataleAndrea. General anesthesia reduces the prevalence of pulmonary vein reconnection during repeat ablation when compared with conscious sedation: results from a randomized study. Heart Rhythm. 2011;8 (3):368–72. Di Biase Luigi, SaenzLuis Carlos, BurkhardtDavid J, VaccaMiguel, ElayiClaude S, BarrettConor D, HortonRodney, BaiRong, SiuAlan, FahmyTamer S, PatelDimpi, ArmaganijanLuciana, WuChia Tung, KaiSonne, ChingChing Keong, PhillipsKaren, SchweikertRobert A, CummingsJennifer E, ArrudaMauricio, SalibaWalid I, DodigMilan, NataleAndrea. Esophageal capsule endoscopy after radiofrequency catheter ablation for atrial fibrillation: documented higher risk of luminal esophageal damage with general anesthesia as compared with conscious sedation. Circ Arrhythm Electrophysiol. 2009;2 (2):108–12.